Are you a skilled enough driver to save this car from getting trashed? 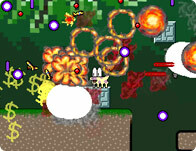 Put your reaction time to the test in this awesome action game! The goal is to keep your car out of the junk yard, no matter what it takes. Be quick and avoid danger to keep your car on the road and out of the dump in this fast-paced game. Be ready to make some quick decisions, as the only thing keeping this car from being trashed is you. Stay sharp and act quickly if you want to save this sweet ride! Be an amoeba and absorb blood cells to remain healthy!